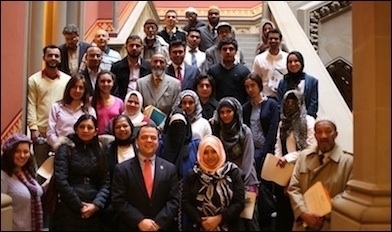 A delegation organized by the Council on American-Islamic Relations (CAIR-NY) in Albany last year to lobby for a bill introducing halal lunches in New York public schools. In recent years, three American public school districts have provided taxpayer-supported lunches meeting Muslim students' dietary standards. They have not similarly provided lunches satisfying any other students' religious standards. The halal foods purchased with public funds are costlier than comparable non-halal foods. This is problematic under the U.S. Constitution's Establishment and Equal Protection Clauses. Even if a school district endeavors to provide all students with food satisfying each one's religious requirements, it would arguably entangle the government in religious observance and so violate the separation of "church" and state. If a school district goes out of its way to provide food satisfying the religious requirements of only some students, but not others, it risks illegally giving them unequal advantages and elevating their religion over others. This is especially so given that the school food is paid for at least partly with public funds, although the schools have been reluctant to reveal how much tax money is involved. Public schools in Dearborn, Michigan, first began offering halal lunches in 2001. That winter, the school district invited "proposals from halal food distributors to provide food at several of its 28 public schools," and began a pilot program. Presently, according to David Mustonen, director of community and public relations for Dearborn Public Schools, "All schools have a halal option five days a week." Halal public school lunches conflict with the U.S. Constitution's Establishment and Equal Protection Clauses. Dearborn Heights' Crestwood School District started a halal food pilot program in 2013-14. Last year, Crawford High School in San Diego operated a pilot program offering a halal lunch option twice a week. Legislators in both New York City and New York State have proposed mandating public schools to serve halal food. In February 2014, New York City Councilman Rafael Espinal introduced a resolution requiring New York City schools "to provide a halal lunch menu option." Three separate bills have been introduced in the New York State Assembly during the current (2015-16) term that would require public schools in big cities to offer halal lunch options. One of them requires that the food be provided to Muslim students "at no cost." The articles' presumed parents could not or would not provide lunches or argued that unheated packaged lunches were insufficient to enable children to learn effectively. Adds David Loy, legal director of the ACLU Foundation of San Diego & Imperial Counties, "The [San Diego] school district has a valid secular purpose of promoting equal educational opportunity by ensuring that low-income students eat lunch and therefore learn more effectively." New York City's proposed legislation shares these assumptions. The Middle East Forum asked Mustonen whether Dearborn makes kosher or other religiously compliant meals available to students. He responded only: "If there were a demand for kosher lunches (hot or cold) the district would consider that as an option." In other words, no. Neither San Diego nor Crestwood (Dearborn Heights) responded to any questions about whether they provide food satisfying non-Islamic religious requirements. The legislation pending in New York City and State does not require public schools to satisfy religious dietary requirements of non-Muslims. For instance, they are not required to offer kosher meals, despite New York's historically large Jewish population. Few, if any, public school lunch programs in the U.S. benefit students of other religions having dietary restrictions. While the Forum cannot conclusively say that no public school lunch programs in the country benefit students of other religions having dietary restrictions, several public school districts that have traditionally had large Jewish populations were contacted for this article. Districts contacted include: New York City, Philadelphia, Baltimore, Cleveland, Chicago, Los Angeles, Scarsdale, New Rochelle, Lawrence School District (Nassau County, New York), Lower Merion (Pennsylvania), Shaker Heights (Ohio), West Bloomfield (Michigan), and School District 68 and Township High School District 113 (Skokie/Highland Park, Illinois). They uniformly responded that they do not offer kosher lunches. New York City, Baltimore, Lawrence School District, and School District 68 offer a few items, such as juice, marked kosher. Philadelphia and Chicago have eliminated pork products from their menus, and Cleveland has cut back on pork products. Beginning with the 2014-15 school year, the federal government pays for free lunches for all students (i.e., free to students, paid for by the federal government) at a school if more than 40% of its students come from low-income homes. Crawford qualifies for free lunches for all students, according to Loy. Dearborn declined to provide details about the number and percentage of its students participating in the federal lunch program, but as of 2011, approximately 60% of its students qualified for federal help. A number of Dearborn schools, if not the whole district, likely qualify for lunches free to all students courtesy of the federal government under the new federal policy. In any case, it receives millions of federal dollars each year for free and reduced-price lunches. Crestwood (Dearborn Heights) also declined to provide information, but data suggest Crestwood also meets the 40% threshold for universal access to free lunches. As of 2009-10, 46% of Crestwood High School's 1,260 students received subsidized lunches, and as of 2014, 62% of them did. Halal meals for the Dearborn program reportedly cost 20-30% more than equivalent non-halal meals. Halal meat costs more than non-halal meat. Asked about the Dearborn program's cost, Mustonen responded only, "Any increase in cost is off-set by an increase in revenue." He provided no details, and the source of the increased revenue is unexplained. Reportedly, halal meals for the Dearborn program cost the district 20%-30% more per meal than equivalent non-halal meals. Significant dollars are involved: the Dearborn school district contracted to pay $228,000 for halal meat. The time period covered by the contract was not provided. Neither San Diego nor Crestwood (Dearborn Heights) school district responded to inquiries on the respective program's cost or any other issue. Before beginning its pilot program, the San Diego school district reportedly spent "$16 million a year on 22 million meals for students, but adding a halal menu could be a considerable extra cost... the meat is a bit pricey because it is considered hard to come by." A later story about the San Diego halal program mentioned increased cost only in the context of the food being organic, not in the context of it being halal. It gave no specifics, other than stating organic drumsticks cost "a few extra cents." Like Mustonen, Gary Petill, food services director of San Diego Unified School District, stated that increased participation – paid for by the federal government – covered the increased cost. Demand for school lunches at Crawford has increased by about 300 meals (it is unclear whether that figure represents the additional number of meals per week, or the number of additional students participating in the twice-weekly halal lunch option), the cost of which is borne by the federal government, not by parents or students. Not all additional participants are Muslim; the breakdown of Muslim as compared to non-Muslim new participants is not known. Crestwood (Dearborn Heights) food service director Lori Squire did not respond to an inquiry for this article but has reportedly said a maximum of 20% of students who buy their meals opt for the halal chicken patty option. It is unclear to what extent federal funds subsidize those lunches. To sum up, three American school districts are providing Muslim students with food meeting their religious requirements. Dearborn is not doing the same for students of other religions, such as Jews. San Diego and Dearborn Heights ignored questions about how students of other religions are treated. New York City and State are considering legislation that would require schools to provide halal food but not food meeting any other religious requirements. The halal food costs more than comparable non-religiously prescribed food. It is paid for in part or in whole with millions of dollars in federal funds. In effect, Dearborn, Dearborn Heights, and San Diego appear to have established Islam as an official religion, whose rituals are endorsed by the government and paid for with public funds. New York City and New York State may join them. Other religions, such as Judaism, are unrecognized. It may be halal, but it sure doesn't sound kosher.